CentriQS API Documentation - Powerful REST-based Application Program Interface. CentriQS provides a simple yet powerful REST-based application program interface to interact with the program: create, retrieve, update and delete records, perform searches, and more. CentriQS prebuilt and customizable solutions offer advanced features to fit your business needs. However, there may be some specific requirements that are not supported by existing functionality. In this case, you can use CentriQS application program interface to implement necessary capabilities, provided you have a basic knowledge in software development and Web services. Any request can be made within a session which contains information about user authentication and connected database. Note that each new request within an opened session initiates new 5 minute timeout. Metadata contains information of all data types in the database. It has a tree structure and allows users to request contents of particular nod as well as contents of its sub nodes. TmSchedulerRecord table contains records of task schedule items and appointments for displaying on Scheduler view. "Name": "My Task New Name"
OLAP Cubes contain fields of two different types: measures and dimensions. Measures are calculated values and can be of numeric types only. Dimensions can be of any type including reference to Dimension Tables (except for BLOB type and its derived types Image, BigString, etc.). 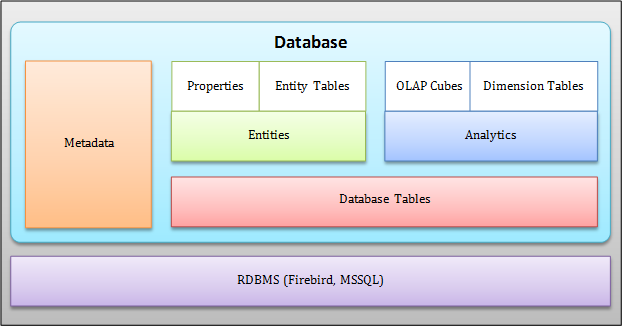 Dimension Tables are reference tables that store Dates & Time, Enums and Entities to which refer OLAP Cube fields.